London: R. Bonwicke et al, 1710. 380 x 240mm. Small damp stain. Sold with the letterpress half-title. 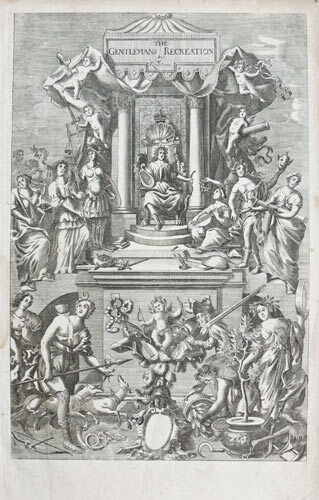 The engraved title to the Second Edition of Blome's 'The Gentleman's Recreation', with allegorical figures of the arts, sciences and sports. First published in 1686, the work describes itself as a 'Short and Easie Introduction to all the Liberal Arts and Sciences, as well as horsemanship, hunting, hawking, fishing, agriculture etc.